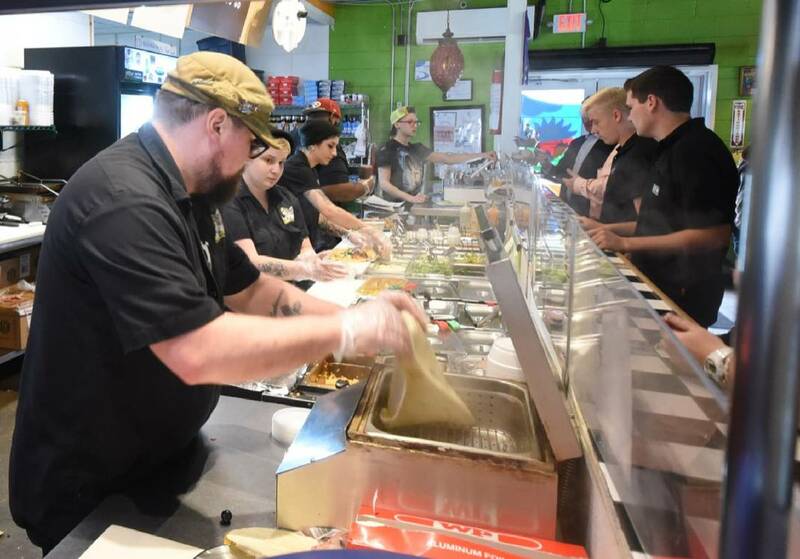 Staff photo by Tim Barber / St. Elmo Mojo Burrito manager Michael Moore, left, works the front line with Katelynn Parker, Emilie Woodford, Davey Oshodi, and Griffin Tedrick at checkout. The owner of Mojo Buritto has agreed to purchase the former Shoney's restaurant on Dayton Boulevard with plans to move the Red Bank eatery if the deal closes later the year. "Because North Chattanooga is spreading into Red Bank, I see its popularity increasing further down the road," said restaurant owner Eve Williams. Williams said she thinks the existing restaurant's patrons at Dayton Boulevard and Signal Mountain Road will drive an extra two miles to the former Shoney's site. Also, that location at 3512 Dayton Blvd. will offer more parking, about 75 spaces, she said. In addition, the building is large enough to have a serving line and a to-go line, Williams said. "That's a huge problem for us," she said. Williams said the former Shoney's building, at 5,100 square feet, is about twice the size of the existing Mojo restaurant. "We need bigger space," she said. Williams said that if she closes on the purchase, she'd like the restaurant at the new location to be open by next March. The restaurateur said the existing eatery sits near a creek and the foundation of that building, which she does not own, is eroding. "It's something I'm very concerned about," she said. "Something will have to be done." But, she said, she'd like to ultimately buy that building, too. If a catering business at the East Brainerd Mojo location takes off, that venture could be transferred to the existing Red Bank site, Williams said. Red Bank Mayor John Roberts said he agrees that growth from the sizzling North Chattanooga area is spilling into his city. He cited new home construction and remodeling in Red Bank as an example. "Everything is coming up the boulevard," Roberts said. He said the former Shoney's location will "pop" especially when the old Red Bank Middle School property nearby is developed. Last month, Williams decided to turn Mojo's East Brainerd eatery into catering and event space and to exit the dine-in business there. She still has three full-service locations, most recently having opened a new restaurant in Ooltewah in Cambridge Square. Williams said she'll "hate" to leave the heavily traveled Dayton Boulevard-Signal Mountain Road corner. But, she doesn't intend to spend a lot of money to get into the former Shoney's site. "It would need some love, some cleaning up and decoration," Williams said.